Studio Imaginaire, the Tonya Bonakdar Gallery’s eighth solo exhibition of Thomas Scheibitz, presents new paintings and sculptures by the artist that invite exploration of the studio as a space between workshop and utopia. Pushing beyond the studio practices of predecessors ranging from Courbet to Mondrian and Bacon, Scheibitz utilizes the formal elements of painting to investigate iconographic questions and the rhetoric of the signifier and the signified. The title of the exhibition, Studio Imaginaire, references Andre Malraux and the Musée Imaginaire, an idea that Scheibitz identifies with in his own practice of collecting and referencing an ever-expanding archive. In the Musée Imaginaire, Malraux sought to amass two-dimensional graphic representations of art from all cultures and time periods, which could be curated, juxtaposed, and reconfigured with limitless facility. Thomas Scheibitz’s new works skillfully bring together selections culled from the artist’s vast collection of found imagery, in a continuation of the artist’s hallmark practice developed over nearly two decades. From fashion photography to Renaissance-era maps, Scheibitz gathers visual information that interests him and then uses it as source material. Through layering, refining and expanding upon these images taken from the common lexicon of contemporary experience, Scheibitz synthesizes the various forms into compositions that superbly distill the amalgamation of relationships in the final tableau. In a similar sense, Scheibitz riffs on Malraux’s Musée Imaginairewith the desire to examine the studio itself as a crucial space in which ideas, images and styles can freely coalesce. The works in the exhibition are united by both their formal characteristics and their palette of bright primary colors, steely blue-grays, and vibrant neons. Numerals and letters find equal footing with the simplified geometries of pyramids, stars, and arrows. Distilled into formal icons, these elements are the building blocks of the artist’s precise compositions. 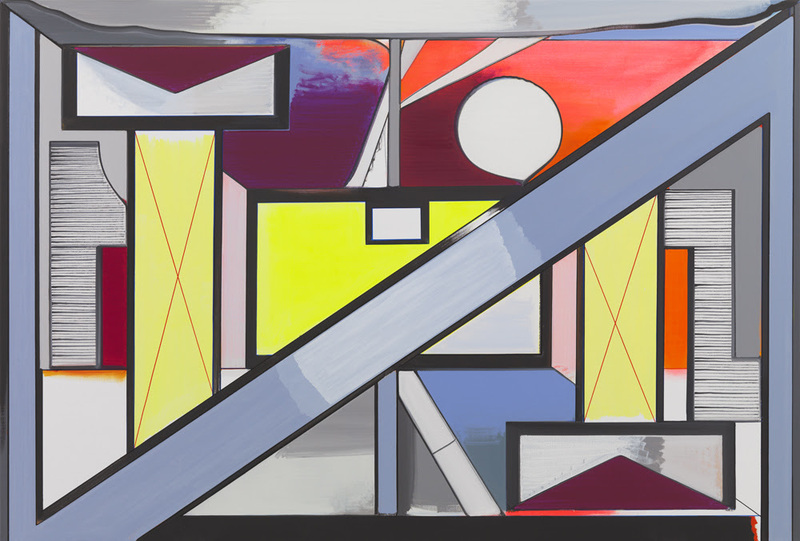 In the downstairs gallery, Scheibitz presents paintings that represent the imagined space of the studio, which are meant to function as places for mental reflection. In each work, the artist alludes to the creative process, while also complicating our perception of it. For instance, in the large-scale painting Wheel of Fortune a central ring demarcates a type of organizational diagram whose contents belong to some unknown system of logic, an assemblage of colors and symbols purposefully suggested while their meaning is decisively left open. In the titular painting of the exhibition, alphanumeric icons and recognizable symbols are brought together in the field of the imagined artistic workspace to construct and define the planar elements that slip between didactic representation and an abstracted composition. Upstairs, reliefs are featured in the main space, in addition to the installation Stage Imaginaire in the side gallery. The elements that compose the stage set serve as a kind of parallel and three-dimensional explanation of Scheibitz’s formal vocabulary, showing how the artist arranges and rearranges his compositions. A large format letter “A,” or perhaps an artist’s easel, mingles with the compositional elements of paintings here materialized in three dimensions. In these works, Scheibitz investigates the concept of “viewable storage,” a space somewhere between still life and conceptual laboratory, which is simultaneously both private and exhibit-ready. Scheibitz sees the assembly of these components as the expression of an intimate mental space, which he translates into the subjects of relief pieces like Portrait E.S., Cloud and Guitar. This transmutation of ideas and imagery is the process by which the artist forms the grammar of the Studio Imaginaire and undertakes the endeavor to reify the imaginary.